Who Knew Halloween Umbrellas Existed? It never occurred to me that designers might be making Halloween themed umbrellas. Duh - its rained on Halloween almost every year in my recent memory, here in Seattle. It's even snowed. Of course people would want cool themed Halloween umbrellas to protect their costumes and painstakingly applied wigs and makeup on Halloween night! This is the Witchy Lady umbrella from Sourpuss. I love it so much! It's also sold on eBay. This anatomical skull umbrella might coordinate well with many of the darker, spookier Halloween costumes you might choose to wear. It's also available on Amazon. 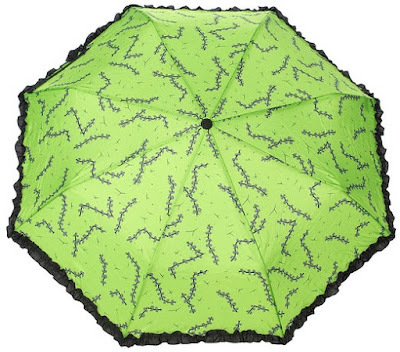 The Sourpuss "Stitches" umbrella might work well with Frankenstein's Monster themed costumes. You can also grab one on eBay. Now I'm waiting eagerly to see who comes out with a jack-o-lantern themed umbrella, or maybe one with spiders and black cats on it!